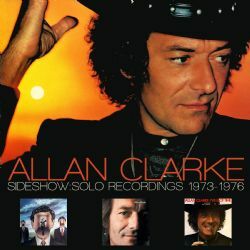 ALLAN CLARKE’s Sideshow Solo Recordings 1973 – 1976 contains 2 discs – disc one of our compilation contains his first two LPs, and disc Two presents his third LP plus the bonus singles. • Allan Clarke, of course, made his name as lead singer with The Hollies, Manchester’s answer to The Beatles, who enjoyed huge success across the 60s and early 70s. • In 1972, he embarked on a solo career on Epic Records with his debut album My Real Name Is ‘Arold (a reference to his true Christian name – Allan being his middle name). The following years, he moved to EMI and stayed for four years and three albums, which have been out-of-print on CD for some time. • The first of Allan’s EMI albums, sported a Magritte-styled cover and opened with ‘Complete Controllable Man’. Clarke produced the album himself, sang and played guitar, with help from guitarist Ray Glynn and keyboard player Kirk Duncan (both ex-The Mirage and Jawbone), Elton John’s bassist Dee Murray and legendary session drummer Tony Newman. It spawned the single ‘Who?’. • Newman and Glynn stayed for 1974’s self-titled album, with bass courtesy of the talented Herbie Flowers (who’d played with Lou Reed among many others) and the ubiquitous pianist Peter Robinson (ex-Quatermass). From it, ‘Sideshow’ was issued as a 45. • After a non-album single – a cover version of Bruce Springsteen’s ‘Born To Run’ – in 1975, Allan returned with his third and final EMI album, I’ve Got Time, in 1976. It opened with another Springsteen song, ‘Blinded By The Light’ – indeed, the LP consisted entirely of cover versions. ‘Living In Love’ (originally by The Sutherland Brothers) was chosen as a 7”. • Disc One of our compilation contains the first two LPs. Disc Two presents the third LP plus the bonus singles.